Silence reigns; there is no noise that cannot be excluded. The daily roar from factories, aircraft, and explosions can all be insulated against. Humans can also be protected from the ravages of radioactive contamination. But there is a price; the loss of man's freedom. This is the dilemma that Dr. Palfrey must solve. Can he do it? The reader is the judge! Born in Surrey, England in 1908 into a poor family in which there were nine children, John Creasey grew up to be a true master story teller and international sensation. His more than 600 crime, mystery and thriller titles have now sold 80 million copies in 25 languages. These include many popular series such as Gideon of Scotland Yard, The Toff, Dr Palfrey and The Baron. Creasy wrote under many pseudonyms, explaining that booksellers had complained he totally dominated the 'C' section in stores. They included: Gordon Ashe, M E Cooke, Norman Deane, Robert Caine Frazer, Patrick Gill, Michael Halliday, Charles Hogarth, Brian Hope, Colin Hughes, Kyle Hunt, Abel Mann, Peter Manton, J J Marric, Richard Martin, Rodney Mattheson, Anthony Morton and Jeremy York. Never one to sit still, Creasey had a strong social conscience, and stood for Parliament several times, along with founding the One Party Alliance which promoted the idea of government by a coalition of the best minds from across the political spectrum. He was also involved with the National Savings movement; United Europe; various road safety campaigns, and famine relief. He founded the British Crime Writers' Association, which to this day celebrates outstanding crime writing. The Mystery Writers of America bestowed upon him the Edgar Award for best novel and then in 1969 the ultimate Grand Master Award. 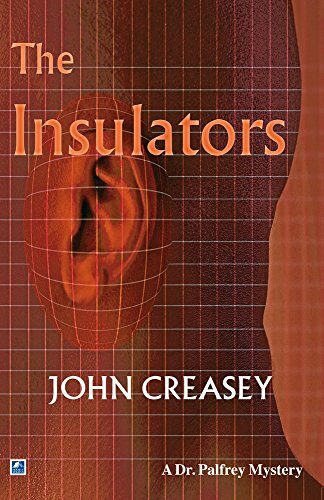 John Creasey's stories are as compelling today as ever, with one of the major factors in his success being the ability to portray characters as living - his undoubted talent being to understand and observe accurately human behaviour.